You are right, closer images have a larger difference in each eye, so their red/cyan positions should be further apart, whereas further objects have a negligible difference, so red/cyan should be closer together. It doesn't matter if you can focus on it, it's the case of how our brain puts the two images together, similar to real life. This is wrong, as I described in previous post. When you look at infinity, your eye axes are parallel. When you focus on screen, your eye axes are intersects at screen, so left/right images must fit each other. But that's you eye doing the work, not the images on the screen. When you focus on something close, you go cross-eyed in order to make the object you are focusing on, the same position in each eye - which is the eye doing the work, not the image on the screen. Of course, with every other object not in the plane of focus, they get blurry and double-visioned. The structure of your retina/pupil also changes to alter the focal lengths, apertures, etc, to make the object come into focus. When you focus on infinity, your eyes are parallel. Edit: Also, SpaceEngineer.. that last photo of the astronaut and spaceship in rift mode looks fantastic! (viewing screenshot on my rift now) The anticipation is killing me..
because we have 2 eyes + parallax + our brain seems to have an incredible way to understand depth. so far from what I have seen of space in the rift my favourite one is elite dangerous. Eye also accomodates (focuses) on the object based on its distance. Our brain uses this information too. 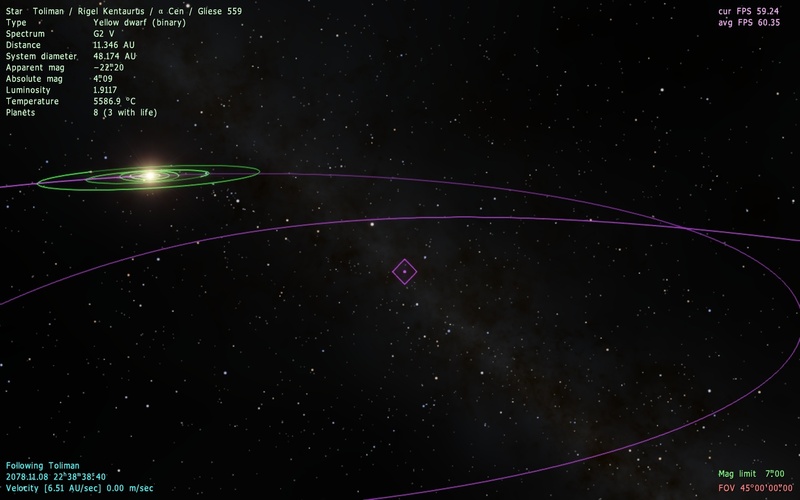 Does anyone have idea how to mark the barycenter when orbits displaying is on? Three perpendicular lines is not a good imo. Maybe 2D cross or big dot? I prefer the small cross. A dot could be too close to a star. Kimb says, "Always go with whatever works!" The Diambond marker is perfect! Does Kimb have to use quotations for words that Kimb always says? Wish i had a 3d dispositive. Always? OK, WHEN was the last timeb I said that?